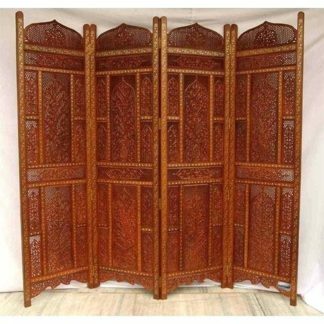 Aarsun Woods handmade wooden Handmade Partition / Room Divider in fine quality wood with fine carving and finishing. The unit consist of single panel in standard size of 30″width in front and 72″height approx.The wooden partition gives very traditional and elegant look to your home.The wooden partition can be placed in zig zag position and can be fold easily and you can easily move it from one place to another. Amazing range of timeless stylish products. And very well monitered and delivered.